Best of Show was awarded to Ward Siegler for his fine art jewelry creations. 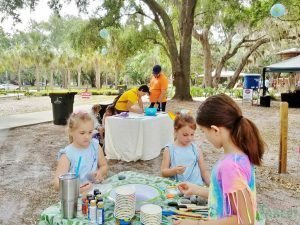 Downtown Clermont – In contrast to Friday evening’s torrential rains, Saturday morning was cool, sunny and perfect for visitors to stroll along Montrose Street enjoying the artwork of talented artists and crafters. The Clermont Downtown Partnership hosts the signature event which averages 10,000 art collectors and browsers all enjoying a cornucopia of art, crafts, food, fun, and local hospitality. Presently, The SOUTH LAKE TABLET has been unable to get a complete list of winners and participants. If you would like to send Shout Outs and pictures of your favorite participating artists, crafters or vendors, send them to news@SLtablet.